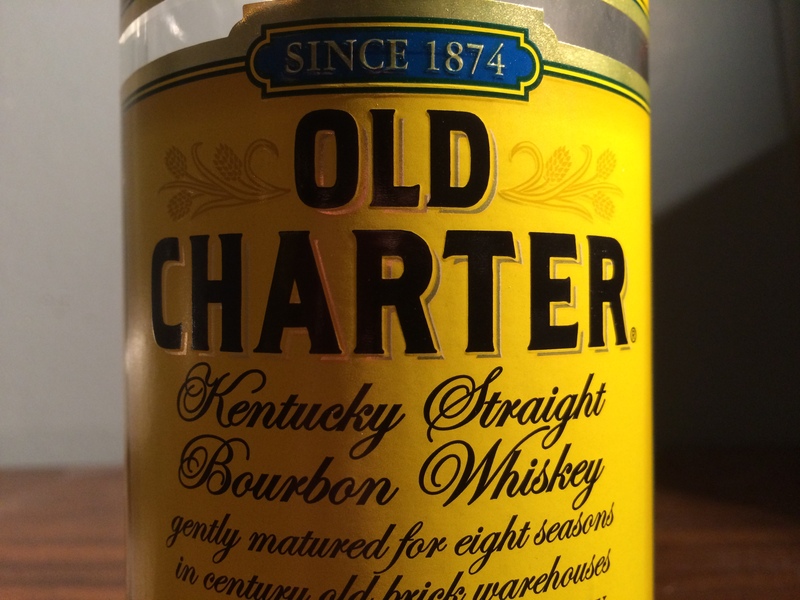 Time for a look into something quite affordable – Old Charter 8 year old bourbon. My buddy Scott wants to see reviews of less expensive bourbon, or “bottom shelf bourbon” as he put it. I guess he’s hoping I’ll rate these much lower than the expensive stuff. Here’s the thing – being on the bottom shelf doesn’t automatically make it a bad bourbon. I have a saying: ” There’s no such thing as bad bourbon.” There’s okay bourbon, and there’s bourbon that’ll knock your socks off. I’m excluding blended whiskies – I’m specifically talking about straight bourbon whiskey. This leads me to Old Charter 8 year old. I’ve seen it on the bottom shelf most places I go, but I don’t think it belongs there. Old Charter is put out by Buffalo Trace. It uses the distillery’s Mashbill #1, the same one used for George Stagg, Eagle Rare and Buffalo Trace bourbons. This one is 8 years old and 80 proof. There used to be older variations of Old Charter, but now we’re down to this 8 year old. Buffalo Trace also puts out a 101 proof. Getting your hands on a bottle that says “Aged 8 Years” maybe be a little hard – the company has removed the age statement from the label and that version is hitting shelves. I’m not sure if they taste the same or not. I’ve only tasted the 8 year old version. I get some light caramel and oak, and a little bit of alcohol fumes. There’s an overall lightness in the aroma. Taste-wise, it’s pretty smooth and has a nice medium body at 80 proof. There’s the standard bourbon caramel sweetness and very light oak. Even a little depth with some butterscotch flavor, but nothing like its flavorful older brother Eagle Rare. The finish is light and bittersweet. Thus far, this is a really nice “smooth” sipping whiskey… definitely better than Gentleman Jack. I find it pretty palatable. Great for sipping neat or an ice cube. I wouldn’t add water to it. Personally I wouldn’t mix it in a cocktail either. I prefer a little bit more “bite” in my cocktails, and I don’t think Old Charter can offer that. I picked up a bottle of this for about $17. So, since the age has been removed from the Old Charter label, how long is Old Charter 8 aged? I don’t have the non-age statement label in front of me, but given that it’s a straight bourbon it is at least two years old. In order to hide this change, the class action states that Old Charter removed the “aged” and “years” from the bottle label, but kept the large, discolored number “8.” The complaint contains pictures showing the old and new labels side by side, which show that they have the same prominent number “8” on the label. This number is “now meaningless,” the complaint argues, and can only act to mislead unsuspecting customers. “This misrepresentation could not have occurred by accident or happenstance,” claims the class action, because of the “subtlety” of the “switcheroo” on the label.